The Josef Suk Piano Quartet was named after Josef Suk (1929-2011), one of the greatest violinists of the twentieth century, the grandson of composer Josef Suk and great grandson of Antonín Dvořák. The honour of accepting the name of a leading Czech artist was proposed to the ensemble by the Czech Society for Chamber Music and with the kind support of Marie Suková, Josef Suk’s wife. The Josef Suk Piano Quartet develops the rich tradition of Czech chamber ensembles, namely of the famous Suk Trio. The members of the quartet are former students of leading Czech musical personalities. Violinist Radim Kresta studied with one of the most inspiring violin teachers, Prof. Bohumil Kotmel, and with Prof. Václav Snítil, a leading Czech violin soloist and long-term member of the Vlach String Quartet and the Czech Nonet. As part of his studies abroad he took classes with Prof. Valery Gradow in Mannheim and Prof. Emi Ohi Resnick in Amsterdam. Violist Eva Krestová(née Karová), a former second violinist of the Pavel Haas Quartet, studied with Prof. Rudolf Šťastný, the long-time leader of the Moravian Quarter, and Prof. Jindřich Pazdera, the leader of the Stamitz Quartet. Cellist Václav Petr studied with the prominent Czech cello teachers Martin and Mirko Škampa, with the soloist Prof. Daniel Veis, formerly a long-term member of the Dvořák Piano Trio, currently member of the Rosamunde Trio, and with Prof. Michal Kaňka, an outstanding Czech solois and member of the Pražák Quartet. Václav Petr has also taken classes with Prof. Wolfgang Boettcher, the former solo-cellist of the Berliner Philharmoniker. Pianist Václav Mácha studied with Prof. Jan Tůma and Prof.
Ivan Moravec, one of the most important Czech pianists of the twentieth century. Václav Mácha has also studied with Prof. Karl Heinz Kammerling in Hoschschule für Musik, Theater und Medien Hannover. The ensemble was founded by violinist Radim Kresta in 2007, initially as the Taras Piano Trio. Under this name the ensemble won prizes at a number of international competitions: 1st Prize at the Johannes Brahms Wettbewerb 2007; 1st Prize at the Premio Rovere d’Oro 2008; or, 1st Prize at the Val Tidone Music Competitions 2010. From late 2012 they played as Ensemble Taras as a piano quartet. In 2013, the ensemble achieved outstanding success winning two 1st Prizes at international competitions: in May 2013 at the Concorso Salieri-Zinetti in Verona, and in September 2013 at one of the most prestigious competitions, ACM Premio Trio di Trieste. 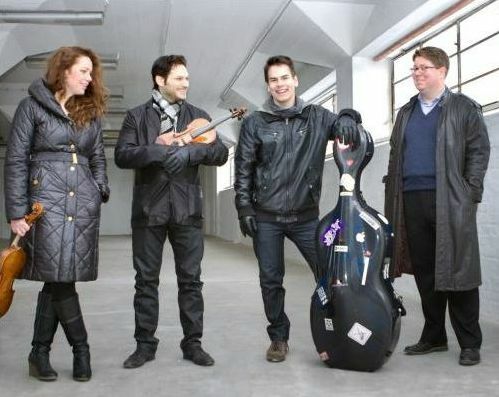 The quartet also became the holdes of the prominent prize of the Czech Society for Chamber Music as the Czech Chamber Ensemble of the Year 2014. Thanks to these successes the ensemble were given unique opportunities of performing on prestigious stages and of recording their début CD and DVD for Limen Music and Arts Milan, with the music of Gabriel Fauré (Piano Quartet Op. 15) and Johannes Brahms (Piano Quartet Op. 60), and another CD for the Azzura Music Label, with the music of Gustav Mahler and Brahms (Piano Quartet Op. 25).